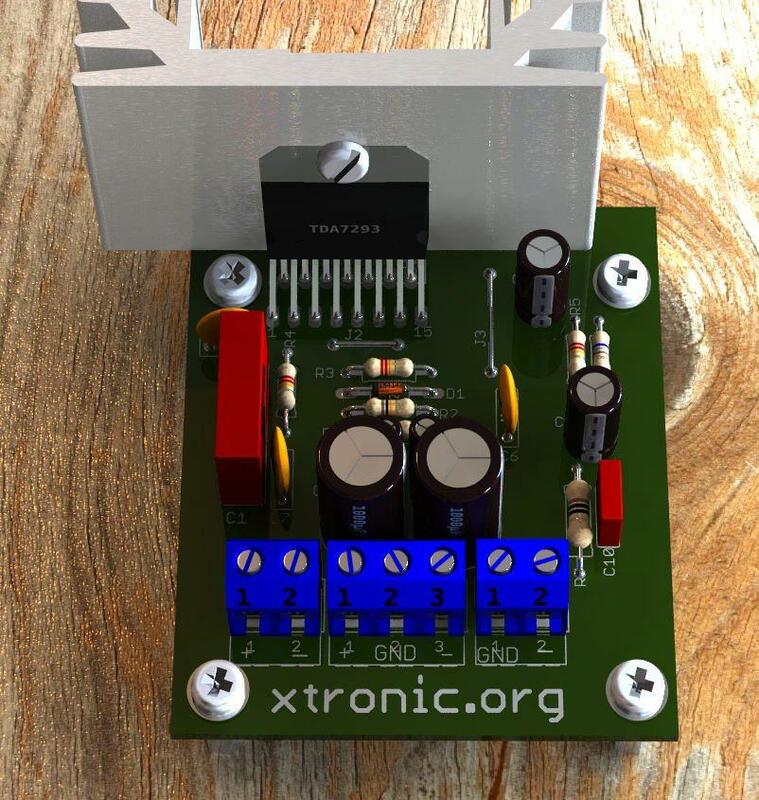 Power amplifier using the TDA7293 chip manufactured by ST Microelectronics, includes schematic and PCB design for easy mounting of the power amplifier. 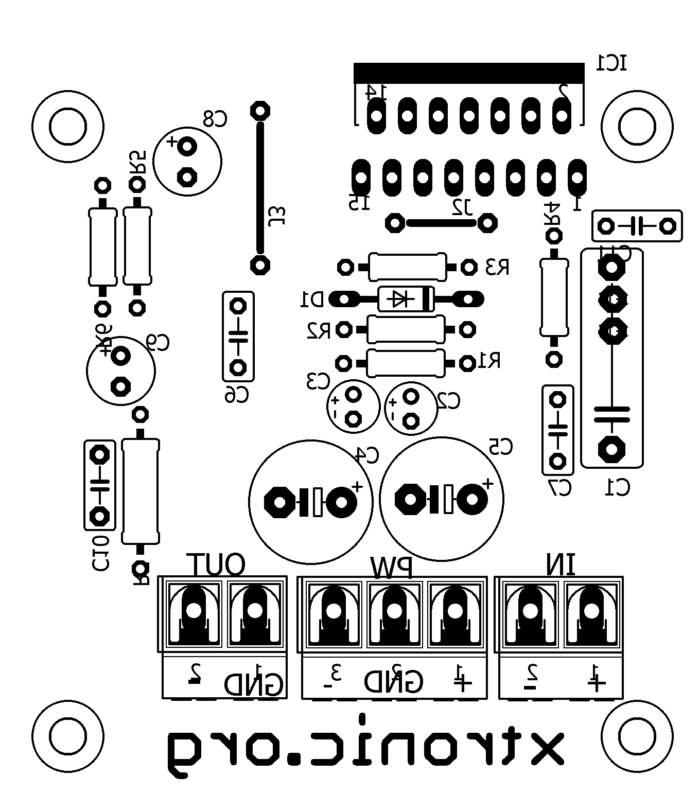 The TDA7293 is a monolithic integrated circuit in Multiwatt15 package, intended for use as audio class AB amplifier in Hi-Fi field applications (Home Stereo, self powered loudspeakers, Top-class TV). Thanks to the wide voltage range and to the high out current capability it is able to sup-ply the highest power into both 4Ω and 8Ω loads. The built in muting function with turn on delay simplifies the remote operation avoiding switching on-off noises. The device is provided with both stand-by and mute functions, independently driven by two CMOS logic compatible input pins. The circuits dedicated to the switching on and off of the amplifier have been carefully optimized to avoid any kind of uncontrolled audible transient at the output. The sequence that we recommend during the ON/OFF transients. The application of figure 5 shows the possibility of using only one command for both st-by and mute functions. On both the pins, the maximum applicable range corresponds to the operating supply voltage. The assembly is similar to TDA7294, but this IC allows use power supply with higher values ​​and thus has a higher output power can reach to 100 Watts. To mount the circuit we have the suggestion of the printed circuit board with PDF files, and Eagle files (.SCH and .BRD) if you need to edit this layout in Cadsoft Eagle. The red line shown in the drawing of the layout is to make the connection using a piece of wire (jumper). To use the mute function, simply connect a three-position switch connector on M / ST. A key can be used for panel mounting enclosure and connected by wires to the connector. The link is as follows the thread of the connector means connecting the second born and the wires on the other side borns. The operation is as follows when the key is to GND and the circuit is muted to V + when the circuit starts up. This process has a delay determined by capacitor C5 and C6. 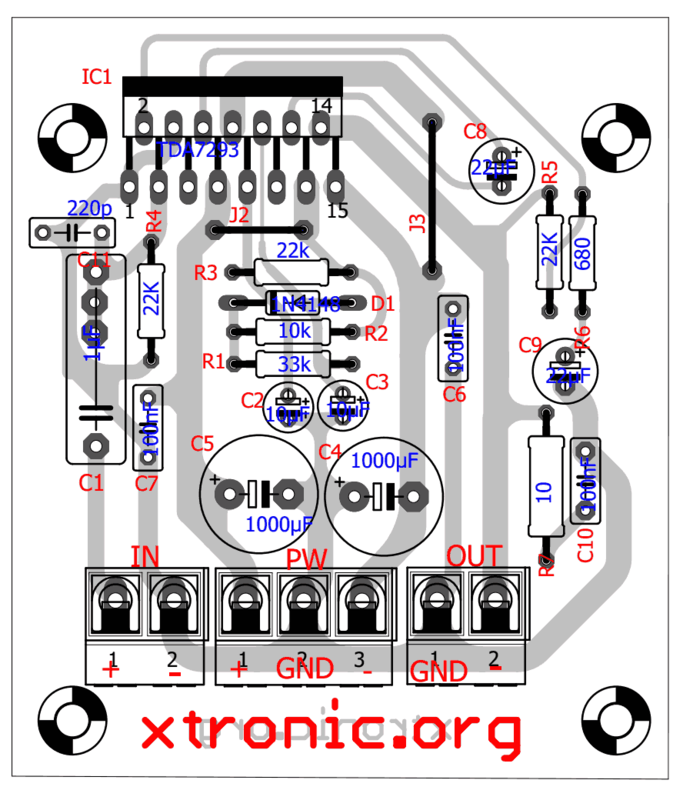 If you do not want or do not need to mute just connect the first and second borns or even need to use a connector just make a jumper to connect the dots. The power supply must be symmetrical as shown in this article, the transformer must be equivalent to 1.5 X Total power amplifier, as this power is related to the maximum input voltage characteristics curves refer to the Datasheet and thus determine the power amplifier to have given power output, and so knowing how your VA transformer should have. The filter capacitors can be used to 22000μF values ​​from 4700μF (for the most demanding). Welding, wires, printed circuit board, Heat sink for the integrated, screws, box, etc. can i used this amplifier with Circuit adjustable bass filter? 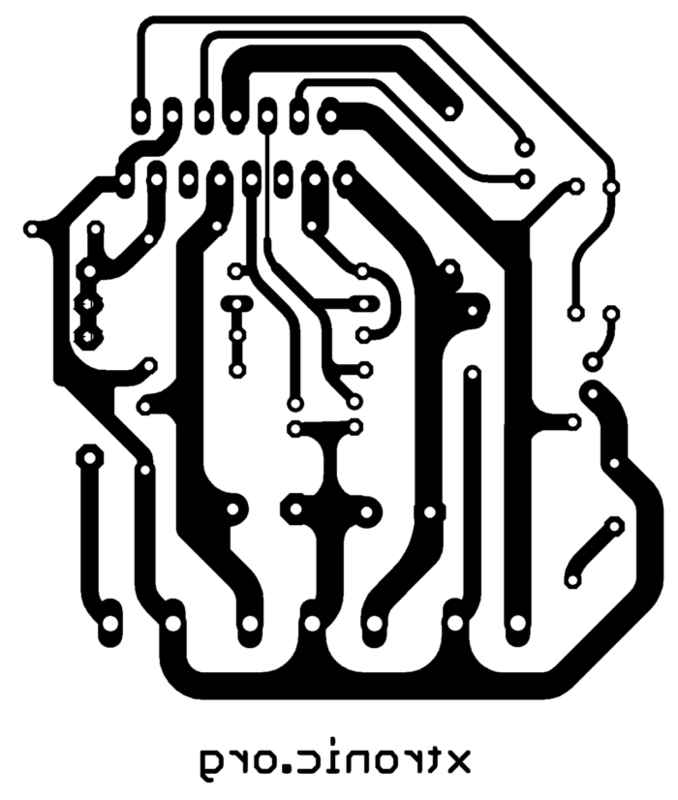 Can you say you using any software for paint pcb? Can You Please Explain why are the C2 and C9 used. i meant to say they are in parallel with 1000uf caps.does it make any difference if we wont use 100nf in parallel? just curious to know why are they places so! Big capacitors handles low frequency ripple and mains noise and major output load changes. Small capacitors handle noise and fast transients. 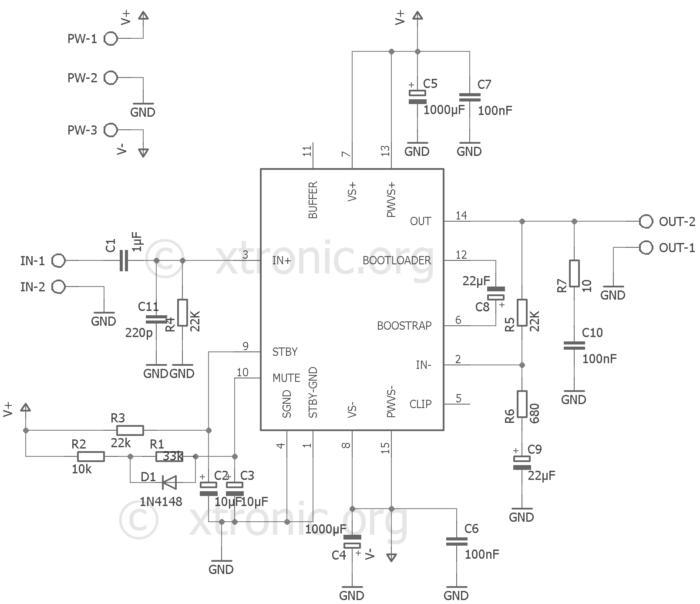 is it enough 30 0 30 5amp for this circuit ? Hello friend… i would like to know how can i change the output to mixed feedback? do you have a parallel circuit and pcb layout of tda7293? i does not nown what say.thank you very much!